Tropical Storm "JUANING" has slightly intensified as it moves toward Quezon area and increases its threat to Southern and Central Luzon. Tropical Cyclone Warning: Tropical Storm "JUANING"
West Northwest at 15 kph. Residents in low lying and mountainous areas under signals #2 & # 1 are alerted against possible flashfloods and landslides. Likewise, those living in coastal areas are alerted against big waves or storm surges generated by this tropical cyclone. TS "JUANING" will enhance the Southwest Monsoon and will bring widespread rains over the Rest of Luzon and Western Visayas. The public and disaster coordinating councils concerned are advised to take appropriate actions and watch for the next bulletin to be issued at 11 PM today. Is SM starting work in Brgy Anonas? Still fresh from the opening of SM Urdaneta Central back in May, we #Urdanetizens are truly feeling the effects of having the retail giant in our backyard. It is safe to say that our city can truly sustain such a large business. 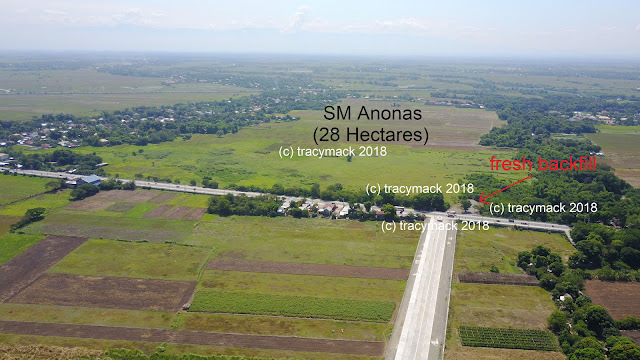 Lately, our friend, Mr. Tracymack caught a drone shot of the larger property in brgy. Anonas where there seems to be some activity with some fresh backfill. Will we be seeing the larger SM Mall built soon? Your guess is as good as ours. What do you think? Let us know your thoughts in the comment box. Update (06/22/2018) The area with backfill is a private property and is not part of the SM Prime Holdings. Caller: Opo, nais po naming ibalita sa inyo na napili po kayo sa pamamagitan ng electronic raffle at napili po ang number nyo upang tumanggap ng munting regalo mula sa Philippine Electronics Association. Ito ay walang obligsyong bumili. No obligation to purchase naman po. Tatanggap lang po kayo ng regalo. Caller: Opo, kayo po ba ang may-ari ng number na ito? Caller: A ok, kasi po, bilang pasasalamat ng Philippine Electronics Association, sa aming anibersaryo ay napili po kayo, at dahil nationwide naman po sya, ang pinaka-malapit na pick area sa inyo ay sa CB Mall. Caller: Malapit po ba sila sa Urdaneta? Me: Nasa Urdaneta po ako.